Now what actually is a spectrum? Let us go back to 6th or 7th grade when we were studying about rainbows and prim, how light is made of different colors. That band of color is known as spectrum if you recall. Spectrum defines a broad variety. Similarly the word Response Spectrum defines the broad range of response of different buildings under a seismic loading. Now you may wonder what kind of response are we looking for? Well, it can be anything, a displacement spectrum, a velocity spectrum or an acceleration spectrum. But when I said for different buildings, then what kind of property are we looking for in a building that can clearly define the dynamic nature of the building? Well, if you have looked carefully into dynamics and Newton's equations of motions, a very basic term called the period of the structure and stiffness of the structure pops up very frequently. This period or frequency of the structure itself can tell us a lot about the building nature. Let us discuss about that in a moment. Before that let us talk about this spectrum, a response spectrum is more often created by plotting the spectral accelerations against the time period. What is unique about structural engineering or I should say building analysis and design, is that every structure is present on a different longitude and latitude, which means is that all the buildings are located at different distance from the earthquake fault, soil conditions, soil surrounding the building site, topography of the region and overall geology. Thus the same earthquake can cause different impact onto different structures. Now the response spectrum that is generated depends on the type of soil at the site and the distance of building site from earthquake fault, each site for a particular building will its own response spectrum. How does site soil conditions affect the response spectrum? Soil at a site can be classified as very stiff soil, stiff soil, soft, very soft and infills. On the basis of stiffness of soil, there is variation in the seismic waves. Let us say fault ruptured at a certain location causing a massive earthquake. The seismic waves at the location of the fault have different frequency as compared to the seismic waves at the site. Why does this happen? This happens because of two fundamental reasons. One is wave travels some distance and this will cause losses in energy which means the peak ground accelerations start decreasing. The other is waves get modified by the soil conditions. This of soil as a filter and every type of soil responds to seismic waves with certain frequencies and will oscillate at its own natural frequency. Now ground shakes different buildings at different accelerations. This is because some buildings can respond quickly to the seismic waves as compared to the other high period buildings. How we develop a spectrum is quite important to understand as it explains the impact of soil conditions on different types of buildings and structures. Let us look at an image to understand this scenario. But in the graph above, how do we determine the intensity of shaking? Well the intensity of shaking is decided on the basis of peak ground accelerations (PGA). This is the value of the acceleration of the ground at the site which is measured on the basis of direction and distance of site relative to the nearest fault. This value corresponds to the value of spectral acceleration at 0 second period in the graph. Once you know the intensity of the shaking then you oscillate the building on that site with this acceleration value and the soil type, you start shaking buildings of different periods. The buildings will respond at their own natural frequencies but the magnitude of displacement, acceleration and velocity will depend on the PGA. This acceleration response is recorded and plotted in the graph above for buildings with different natural periods. Thus if you keep on doing this for buildings having periods ranging from 0.1 seconds to 10 seconds, you have your very own response spectrum for the specific site. Hard soil means stiff soil in many building codes. A stiff soil will resemble like a stiff table that will oscillate very violently. This type of soil vibrates at very high frequency or very low periods. The buildings that correspond to a high frequency is a short structure, a 3 to 5 story building. This means a building that is 3 story tall in hard soil will experience "proportionately" high value of seismic forces as compared to a 40 story building. A 40 story building does not easily respond to a high frequency shaking because of its long natural period. 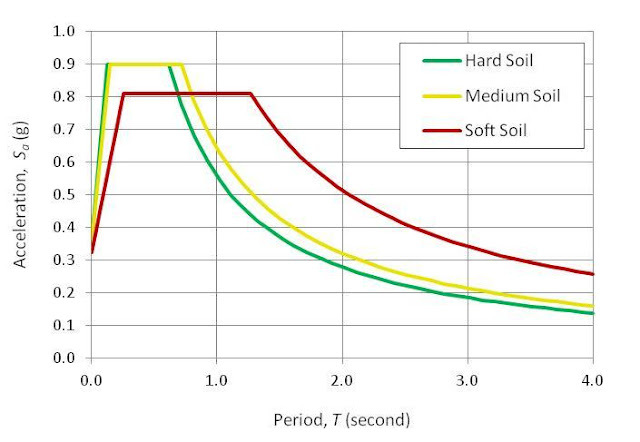 Medium soil is the one that has medium stiffness, somewhere in between hard and soft soil. This causes some increase in forces for buildings that are about 7-10 stories and taller. As the soil is softer, the natural period of vibration is longer than hard soil. This in turn means that the buildings that are taller will experience more loads in such site class compared to the ones in hard soil. So the 40 story building we talked about, it will now face "proportionally" higher forces in medium soil as compared to hard soils. To understand why? Check out this youtube video as how soil frequency changes the response of the structure. Now a soft soil will act like a water body for a small structure. For example a small structure in a very soft soil will act similar to a boat in an ocean that is caught up in a storm. Well not that drastic but you get the idea of why a small structure will not respond to seismic waves in very soft landfills. But on the other hand, a tall building constructed in soft soil will face significantly larger forces as compared to their counterparts built in medium and hard soils. 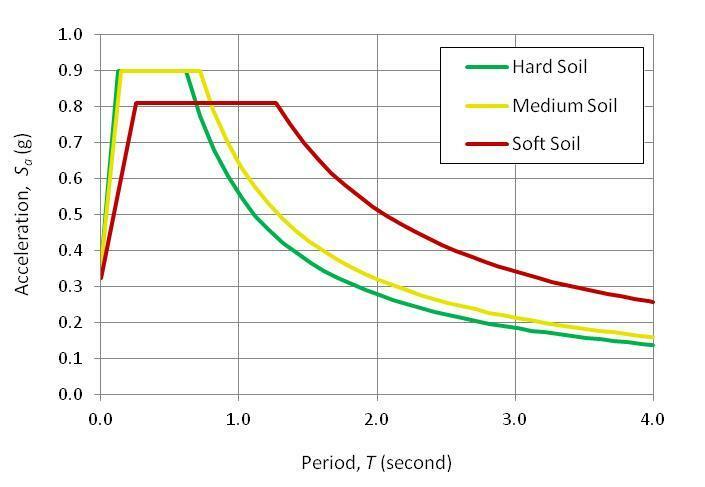 A soft soil oscillates significantly slower and has a longer natural period. This longer period of soil resonates more will tall buildings and so it increases the forces drastically. All this explanation is clearly visible in graph above where at low periods, the seismic response of shorter buildings is more for hard and medium soils while it reduces for soft soils. But the exact opposite is true for tall buildings that is high period structures. As you move from stiff soil towards soft soil, the seismic response of tall building increases. The two blog series should give you an overall idea of how a response spectrum is generated considering different periods of structures and how the soil type modifies the response of the building itself. There is third parameter that goes along with all of this and that is damping. Every building has some inherent damping value associated to it and generating a spectra without any damping will not make sense at all. So most of the building codes recommend a 5% damped spectrum that should be used to design the buildings. Then sir how can we make possible construction o tall structures in soft soils? Can it be done by dissipation of the energy or is there any technique for reducing the peak ground acceleration in the vicinity of the structure before the acceleration reaches the structure?! The structural design will be carried out for this higher intensity of loading. In soft soil a tall building will require a stiff structural system so that it can cope up with the deformation demands coming in from the ground accelerations.